Twelve-inch serving platter is oval in shape and made by Enoch Wedgwood between 1966 and 1968. 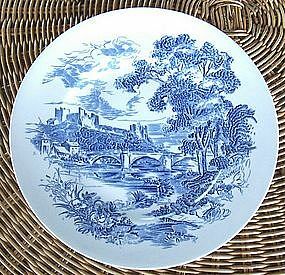 In the Countryside pattern, it shows blue English country scenes. Used, in good condition. Shows checking on both sides but no chips or cracks. There is some discoloration from heat (see photo). Five-inch bowl is made by Enoch Wedgwood between 1966 and 1968 can be used for fruit, dessert or sauce. 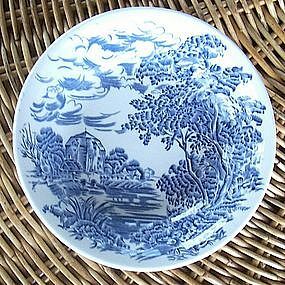 Countryside pattern shows an English country scene in blue. Used but in very good condition. Lists on www.replacements.com for $7.99 each. Weight is 8 oz. each. Use USPS link on my home page to calculate priority mail postage from zip code 43570 to your zip code. If other form of shipping is desired, please email with preference and zip code. 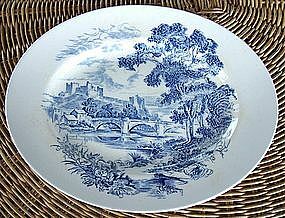 Ten-inch dinner plate by Enoch Wedgwood in the 'Countryside' pattern depicts an English country scene in blue. (Discontinued 1966 - 1968) Used but in very good condition with no chips or cracks. There are some minor mold imperfections and grazing. Lists on www.replacements.com for $11.99 each.